HSBC survey ranks China 5th overall in quality of education, 13th overall in costs out of 15 countries. So why not enjoy the best of both worlds and study in China???? VANCOUVER, Sept. 10, 2014 /CNW/ - Education has never been more expensive, or more highly valued. According to the latest report from HSBC, The Value of Education: Springboard for success, nearly three quarters (74%) of parents around the world would consider sending their child abroad for a better university education, and half (51%) globally rank the USA as providing the highest quality of education, followed by the UK (38%), Australia (25%) and Canada (20%). The average cost of a university undergraduate education for an international student in Canada is nearly US$30,000. By comparison, a Canadian student will pay, on average, over US$36,000 per year to study in the USA, and US$42,000 a year to study in Australia1. The report, which surveyed over 4,500 parents in 15 countries, suggests that parents recognise the value of a good education, but too many are still financially under prepared. Some 89% of parents across 15 countries said that they wanted their children to go to university, but 51% globally (32% in Canada) also wished they had started saving earlier for their child's education. Planning to study internationally also requires a holistic analysis of costs and benefits - tuition, books, rent, food and transportation must be weighed alongside quality of education and liveability. When asked to identify their top three countries based on quality of education, respondents chose the USA, the UK and Australia. Those same countries also happened to feature the highest overall costs per year. 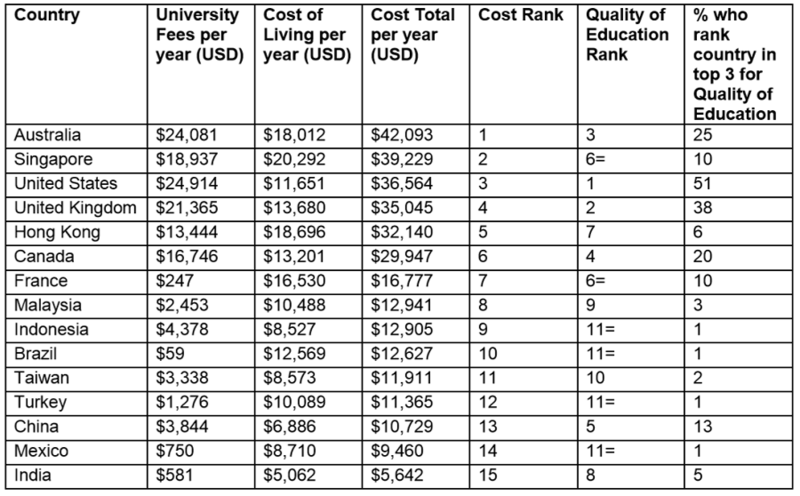 While Canada ranked 4th in terms of quality of education, it ranked 6th in terms of cost, which suggests good value for money. Betty Miao, Executive Vice President, Retail Banking and Wealth Management, HSBC Bank Canada, said: "Parents send their children to school internationally to acquire new languages, build international experience, and foster independence and self-reliance. Because parents often fund the bulk of their children's education, they are keen to make the best available choice in order to provide their children with a competitive advantage to position them for better career opportunities." While only 20% of global respondents ranked Canada tops in terms of quality of education, stats from the Canadian Bureau of International Education show that we rank as the 7th most popular international student destination and our international student population has nearly doubled over the course of a decade (136,000 in 2001 to 265,000 in 2012). As most universities are located in Ontario, British Columbia and Quebec, this is also where you'll find most international students (79%). Nearly two-thirds of all international students in Canada hail from five countries: China, India, South Korea, Saudi Arabia and the USA.